Generalized schematic of the global carbon cycle. 4% of all carbon is converted to methane by methanogens. We use methane-producing archaea (methanogens) as a model system to understand biological methane production. 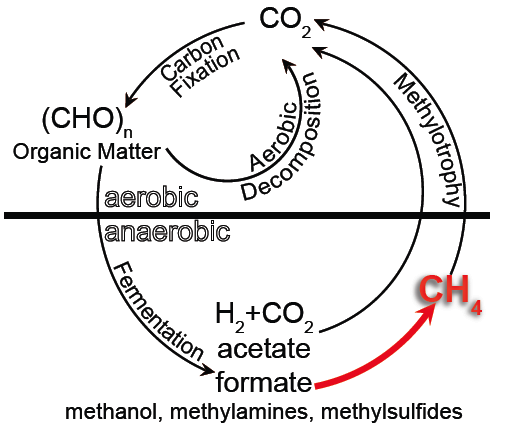 methanogens are strict anaerobic archaea that obtain all their energy for growth and reproduction by reducing fermentation endproducts like acetate, H2+CO2, formate, methanol, methylamines, and methylsulfides to methane gas. Methanogens are the dominant archaea in anaerobic sediment where sulfide concentrations are low, and are also dominant archaea in the rumen of cattle, in the termite hindgut, and in the human digestive tract. Methanogens produce 2 gigatons of methane gas annually, representing 4% of the global carbon cycle. Methane produced by methanogens can be harvested and used as a heat and energy source. Large dairy farms and wastewater treatment plants commonly harvest methane produced in anaerobic digesters and offset nearly all of their heat and energy needs using renewable methane. Currently, European countries (Switzerland, Germany) use renewable methane extensively, and are projected to steadily increase their use of biologically-produed methane in order to phase out consumption of fosil methane derived from geological sources. 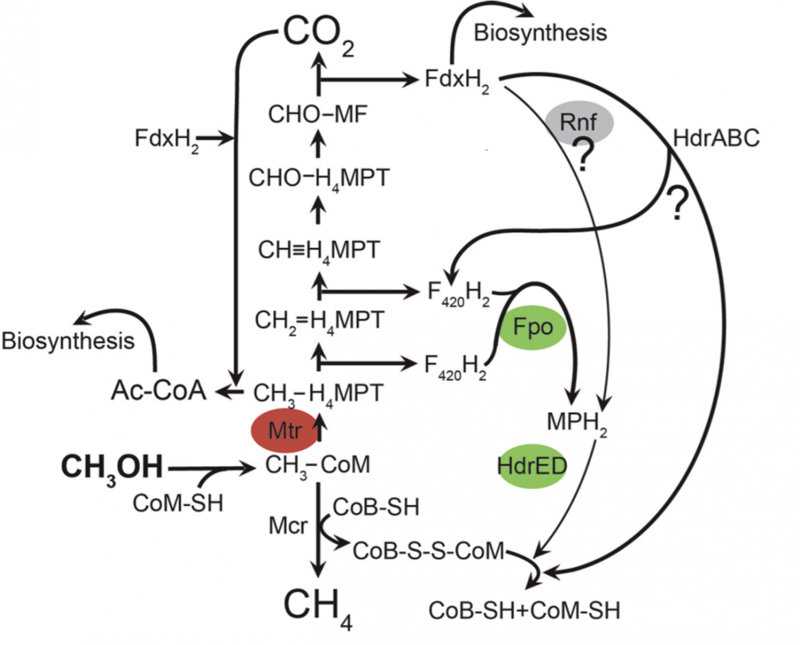 The Buan Lab uses our expertise in microbial physiology and redox biochemistry to understand methanogen metabolism in order to discover new biochemistry and to engineer methanogens to increase the rate and yield of methane production from renewable feedstocks. This research is supported by the National Institutes of Health via the Nebraska Redox Biology Center, and the National Science Foundation. Translational projects have been supported by the Nebraska Center for Energy Sciences Research and the Water Environment & Reuse Foundation. The human digestive tract is a strict anaerobic environment where bacteria, archaea, and fungi cooperate to help us digest our food. Microbes have evolved with us (our microbiome), and changes in microbiome populations are associated with diseases such as obesity, diabetes, colitis and Crohn's disease. To understand how microbes cooperate with each other and with us, we need to identify and interpret the chemical messages they send and receive. Because all cells need food and energy, metabolites like acetate, formate, propionate, butyrate, and hydrogen have a profound effect on the gut microbiome community. -Do primary fermentation products or specific secondary metabolites have a larger effect on the microbiome? 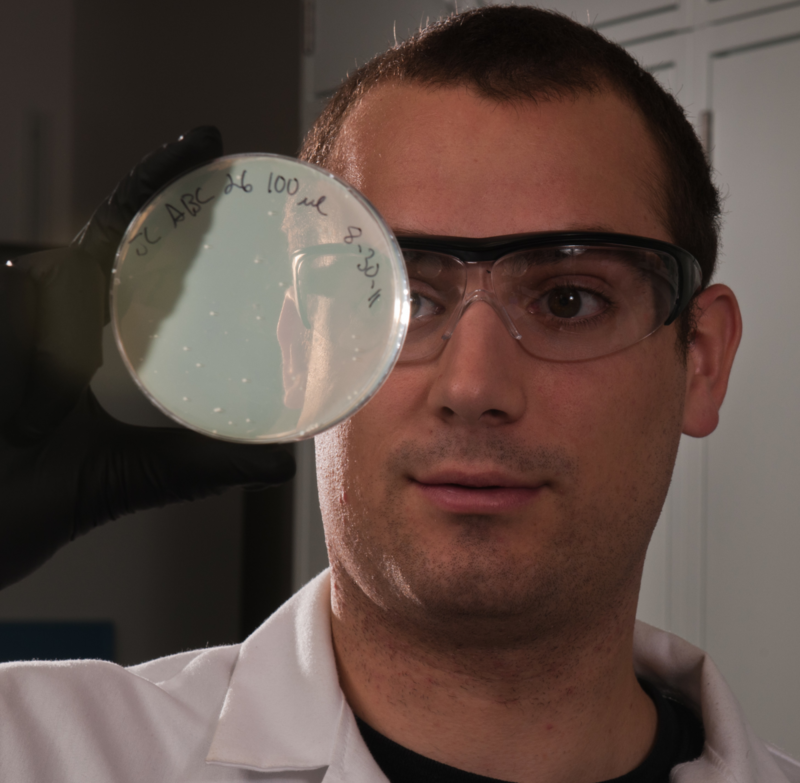 -Can we predict which microbes will grow if we change our diet? -Can we decode microbial "messages" in the gut? This work is supported by the National Institutes of Health via the Nebraska Center for Integrated Biomolecular Comminication, by the National Science Foundation, and has benefitted from working with the Department of Energy Systems Biology Knowledgebase (KBase) scientists. Undergraduate Mitch Shea examining a plate of transformed colonies. 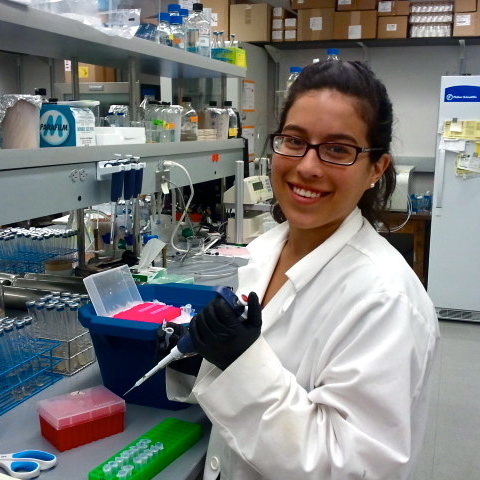 Alicia Ortiz preparing for PCR.